Most people know our genetic code involves the letters A, T, C and G (adenine, thymine, guanine and cytosine) to make up DNA. But what fewer people know about is the code found in the packaging of DNA. And there is a lot of it there. Until recently, we didn’t have a good way to systematically get at that information. Science took a big step forward in being able to do this with the publication of the most precise map to date of how human cells organize their 6 feet of DNA into their nuclei, a space that has a diameter of only around 0.0000016 inches. This kind of map will not only tell us how the instructions in our DNA lead to making each one of us, but it may also provide new ways to understand and even treat diseases like cancer. In this study, Baylor College of Medicine researcher Suhas Rao and coworkers focused on a part of nuclear organization called DNA loops. Basically, our DNA forms a set of loops that each act as an independent region. Each loop has a set of controls for genes in that loop that don’t affect genes outside of that loop. One of the most surprising results of this study was that instead of the one million loops that many scientists expected, the authors found only around 10,000 of them. Not simple to study but definitely a more manageable number than one million! One way to think about these results is that it is a bit like the original human genome project. Just like that original DNA sequence, it is providing us with a reference to which all other studies like this can be compared. Scientists will be able to, for example, determine how DNA is packaged in the cells of people with certain diseases and compare it to this reference map. From that comparison they may be able to better understand why a certain DNA change leads to a certain disease. This matters because many of the DNA differences scientists are discovering that are important in human disease happen outside of the 2 percent of DNA that comprise our genes. This makes it very hard to know why a DNA change is causing a certain problem. And if we don’t know the reasoning, it is hard to come up with a treatment for that disease. Most likely many of these DNA differences affect how a piece of DNA controls a gene but it has proven very tricky to connect the gene to the DNA difference. This becomes much easier with the mapping of DNA loops. Most people have heard of genes, those stretches of DNA that each have the instructions for one small part of us. But as scientists have known for quite a while, this 2 percent of our DNA is not the whole story of our genome. The other 98 percent plays an important role in determining when and where a gene should be on and to what level. One way that genes are controlled is with short DNA sequences called enhancers. These enhancers turn on genes in some cells and not in others. 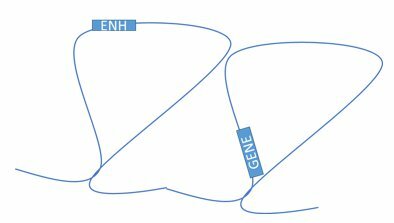 What has been hard to understand with these enhancers is how they know which genes to turn on and which ones to leave alone. In the bacterial world it is easy…the equivalent of an enhancer turns on whatever gene is closest. The same is not true in eukaryotes like us. 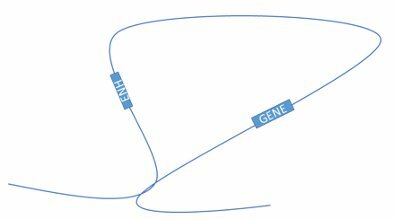 Enhancers sometimes ignore genes that are closest to them and instead activate a set of genes that is much further away. It turns out that one way they are able to pull this off is by only working within their own DNA loop. So imagine a bit of DNA that turns on many nearby genes. We will call it ENH for an enhancer. Since the enhancer is in a different loop, it doesn’t affect this gene. The gene stays safely off. The two loops have merged into one big loop. 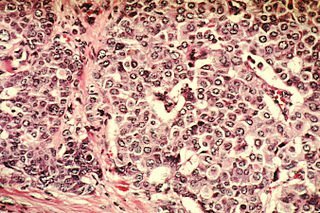 Now the enhancer can turn on the gene causing cancer. This would be very hard to figure out without a map like this. The mutation that caused it isn’t in the enhancer or in the gene itself. It is somewhere else that affected how the DNA in the cell was looped. It is for situations like this that precise 3D maps of the human genome will prove to be so useful. And of course, science isn’t just about curing disease. Maps like these will also help us understand why different kinds of cells look and act differently even though they all share the exact same DNA. Or how a single cell develops into the trillions that make up a human. Or about a million other cool things. 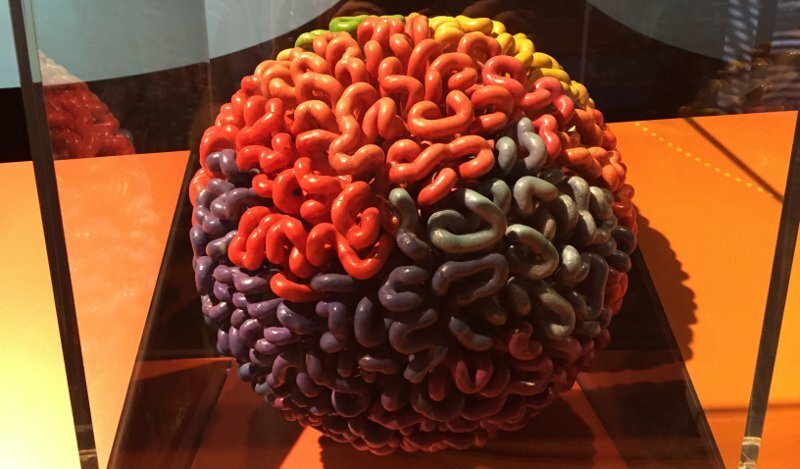 The Tech Museum of Innovation is hosting a traveling exhibition from the Smithsonian, Genome: Unlocking Life’s Code until April 27, 2015. Come and see it to learn more about what that original human genome project has allowed us to learn about ourselves over the past decade or so.